The facets cut into the edges of this clear crystal arrowhead pick up light and surrounding color and reflect it throughout the piece. Mounted on a clear crystal base and packaged in a velvet lined gift box, this premier crystal is a perfect way to recognize and honor top performers and milestones in your organization. 9" H x 2 3/4" Sq. Imprint area 2 1/2" x 4"
10 1/2" H x 2 3/4" Sq. Imprint area 2 1/2" x 5"
12" H x 2 3/4" Sq. Imprint area 2 1/2" x 6"
Add an Olympic theme to your next presentation. 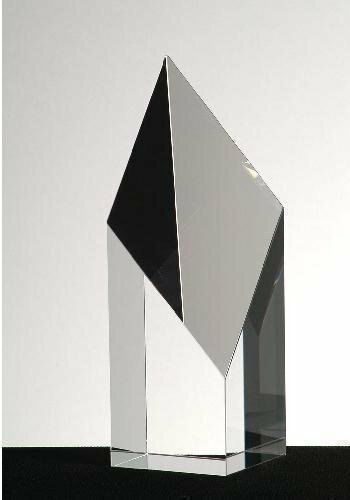 This beautiful optic crystal award is highly polished, pure and colorless. Any recipient would be proud to show off the sparkle of this crystal award.